Lake Berryessa is one of the largest freshwater lakes in California with more than 200,000 surface acres of water. Its shoreline extends 165 miles, though the lake is only three miles wide. Each year more than 1.5 million visitors enjoy the popular year-round recreation and the privacy that Lake Berryessa offers. The lake is conveniently located to both Sacramento and the Bay area, with Napa and Winters just a short drive away. A variety of trees, plants, and wildlife are found in the rolling hills around the lake. Lake Berryessa has become popular among bird watchers who often spot eagles, hawks, pelicans, snow geese and loons among many other bird species in their natural settings. Water temperatures range from 47 °F to 76 °F, making it an ideal habitat for both cold and warm water fish. 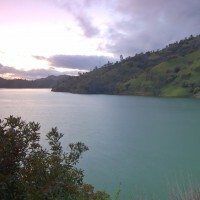 A variety of bass and trout as well as Catfish, Crappie, and Bluegill fish are found in Lake Berryessa. Other activities include water skiing, jet skiing, and tubing. Popular activities among visitors are kayaking and canoeing on the lake while looking out at the enchanting Blue Ridge and Cedar Roughs. Another way to take in the beautiful scenery surrounding the lake is to hike the trails along the Lake Berryessa Federal Recreation Area. The Pleasure Cove Marina is a full-service marina that provides an assortment of houseboats, ski boats, deck cruisers, and boat slip rentals. The marina has a convenience store for last-minute items you might have forgotten for your trip. There are lakeside cabin rentals available or groups of 4 to 8 people. The marina facilities also include campsites and RV sites.